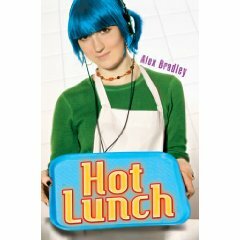 When too-cool-for-you Molly gets into a destructive food fight with new girl Cassie, their initial punishment is being forced to work in the school cafeteria for Mrs. Zetz the lunch lady. But when the two girls drive Mrs. Zetz into early retirement, they are ordered to run the place for themselves. Now they must overcome their dislike for each other and simultaneously turn out decent school meals. It will be a long journey! Another fun book with a good dramatic arc, but also some strange subplots that just sit out there and some really clunky character development. Molly is so unsympathetic at first that the author has trouble turning us around to liking her (almost as if he realized that he had gone a bit overboard with making her mean). As a result, we get all sorts of out-of-the-blue revelations (example: major crush that is only revealed about 90! pages in). The subsequent attempts to give Molly a heart of gold did not work for me.